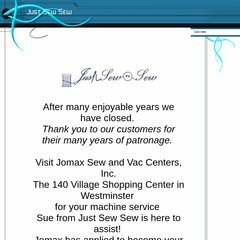 Topics: Classes, Bernina Club, Sewing Tips Tricks, Driving Directions, and Services & Coupons. The estimated 7 daily visitors, each view 2.00 pages on average. The programming language environment is PHP/5.2.17. It has 2 DNS records, ns43.worldnic.com, and ns44.worldnic.com. It is hosted by Monstercommerce Llc (Illinois, Belleville,) using Apache/2 web server.